KH2D.Net - Miscellaneous Ham Radio Information. Note: If you don't intend to use the interface with a SSTV program, you can omit the 220 ohm and 10K ohm resistors, and the two .0047 uf capacitors. On a DB25 serial port connector, pin 7 is Signal Ground and pin 20 is DTR. On a DB9 serial port connector, pin 5 is Signal Ground and pin 4 is DTR. Note: If you don't intend to use the interface with a SSTV program, or your radio does not have an SSB monitor feature, you can omit the Receive Audio/Record Interface. T1/T2 - Radio Shack 8 ohm to 1000 ohm center tap audio transformer (273-1380). RL1 - Radio Shack DPDT 12 volt relay (275-249A). Transistor - 2N3904 (2N2222 should work). WARNING - Use an AC voltmeter to check for ground potential differences before connecting your computer and radio equipment. Do NOT connect the audio ground to the power ground in the interface box. 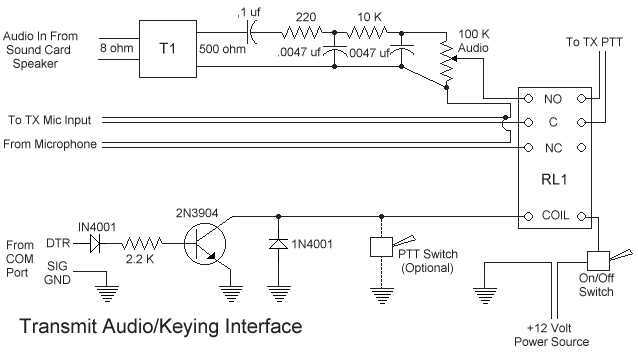 The audio ground must be isolated to prevent hum and RFI problems. Do NOT use jacks in the box for audio/computer wiring unless the jacks are isolated from the box itself. We suggest using grommets and running shielded cable directly to the soundcard/computer/radio from the circuit board inside the box. Test your circuit during construction to make sure you have things wired correctly - don't plug it into the radio and find out you invented smoke. Use a metal enclosure, which may be connected to the power ground but NOT to the audio ground. The circuit is really pretty simple, plus we aren't electrical engineers so we aren't really sure why it works anyway. Audio from the sound card is fed to T1, which isolates and matches (we hope) the impedance a bit better. T1 is followed by a few resistors and capacitors that make a low pass filter (good for SSTV, or so we heard someplace). This mess is followed by a pot, which is the level adjustment for the audio going to the transmitter. The transistor is keyed by the DTR line on a computer COM port, which in turn keys RL1, the relay, where audio is switched from the microphone to the sound card input. The state of COM port lines is not determinable when a computer is loading, hence the Off/On switch to keep the computer from keying the radio when you don't want it to. When the interface is powered off, audio from the microphone passes directly to the transmitter, so it is not necessary to have the box turned on when you aren't using the a DVK, PSK, or SSTV program.